Prescription motorcycle glasses with free-form digital lens technology are now more perfect than ever before. But until last month, this advanced lens design was only available on single vision or progressive lenses, so riders looking for the benefits of the bifocal design did not have any good options. 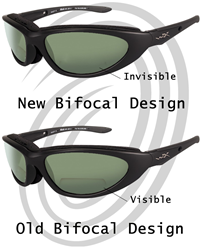 The new free-form digital bifocal design does not show a visible line. With a starting price of $155, this new free-form lens design is expected to be a major part of future prescription motorcycle eyewear sales. Prescription motorcycle glasses often have a wrapped frame to provide the most peripheral vision. A new free-form surfacing design has made it possible to eliminate the “fishbowl effect” that has historically been associated with prescriptions on wrapped sunglasses. But for motorcyclists who require reading glasses to see their gauges clearly, a progressive lens design has been their only free-form lens option. The bifocal shape was not compatible with free-form surfacing technology. With a progressive lens, a rider will have at least 16mm of lens space consumed by the reading corridor. This new free-form bifocal lens can fit in 7 – 9mm. This provides a much larger unobstructed view of the road and a safer riding experience. ADS Sports Eyewear is the first company to offer this new bifocal design in 8-base wrapped sunglasses. While the functionality of this lens is much like the old flat-top bifocal design, the line is totally invisible. Another benefit is that the wearer will not see a blurred line like in previous “blended segment” bifocals where the line was just rubbed out. The transition from distance vision to the reading power is actually a very short progressive design. The tradeoffs for gaining a better view of the road are fairly minimal. A bifocal lens has only one focal distance, where a progressive lens will focus at a range of distances from ten feet to ten inches. The advantage of this bifocal design is that gauges will be in focus throughout the entire reading area, as opposed to just a sliver of space in a progressive lens. Riders who have never worn a progressive lens, or never felt comfortable wearing a progressive design, will definitely prefer this new free-form bifocal. The downside is that objects closer to the face may not be quite as clear with the bifocal design. But this small inconvenience seems insignificant for many riders. ADS Sports Eyewear has specialized in prescription sunglasses for active people for over ten years. With a starting price of $155, this new free-form lens design is expected to be a major part of future prescription motorcycle eyewear sales. Most ADS Sports Eyewear sales are through their web site at http://www.adseyewear.com.